Greek 14th- or 15th-century dark brown leather, blind tooled to a lozenge pattern, over heavy boards; in brown morocco case. Purchased by J.P. Morgan (1867-1943), 1920. In Constantinople in the 15th century; owned by an Arabic-speaking person (who added inscriptions in Arabic and genitalia to some animals); owned by Manuel Eugenicos, Constantinople, 1578 (listed in his library catalogue); Domenico Sestini, ca. 1820; collection of Marchese C. Rinuccini, Florence, 1820-1849 (MS Cod. 69); Payne and Foss, London, 1849-1857; Payne sale (London, Sotheby's, Apr. 30, 1857) to Charles Phillipps for Sir Thomas Phillipps (Phillipps Collection, no. 21975); purchased by J.P. Morgan (1867-1943) from Phillipps's estate in 1920. 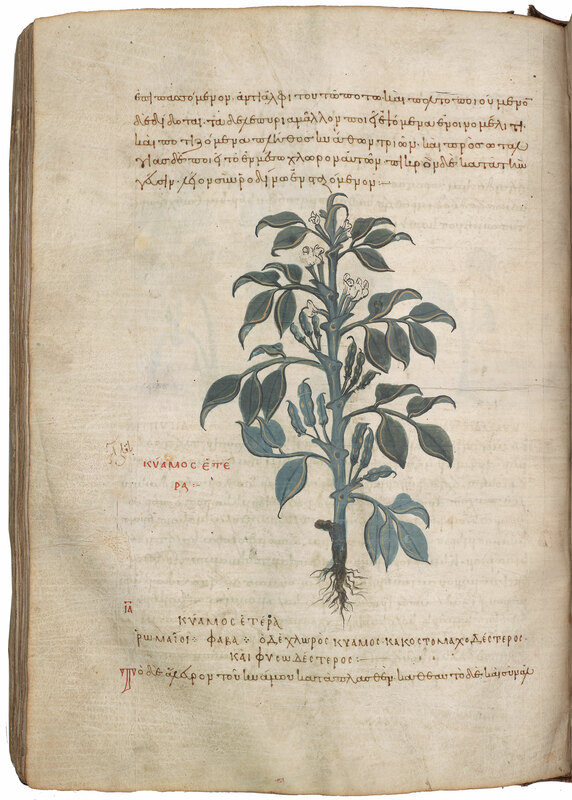 Ms. herbal; written and illuminated in Constantinople in the mid 10th century. Alphabelical Five-Book version of Dioscorides, De Materia Medica. Decoration: 769 illustrations; several headpieces and tailpieces. Plant and animal identifications are based primarily on Morgan Library notes and Dioscorides, De Materia Medica, trans. Lily Y. Beck (2005). Also consulted: André, J., Noms de plantes dans la Rome antique (1985); Der Wiener Dioskurides: Codex medicus Graecus 1 der Österreichischen Nationalbibliothek, Kommentar von Otto Mazal (1998-1999).